It’s the final race weekend for the 2018 Formula 1 season and we’re in Abu Dhabi where the sun is shining and where drivers are all getting prepared for the Qualifying session ahead. Did you Know? This is the most expensive f1 venue costing a whopping $1.3billion! Drivers are now making their way to the garages and getting ready for Qualifying. Fernando Alonso is the first car out on track – it’s his final race weekend, he’s saying Goodbye to the sport – for now! The sun has just started to set, this is when the temperatures will start to drop too and things will be changing throughout the session. Kimi Raikkonen now makes his way out on track – it’s his final weekend with the Scuderia Ferrari team as he’s making his way to Sauber for the next season. Kimi Raikkonen now sets the fastest lap time as Sebastian Vettel starts his lap – taking the corner rather wide, allowing him to make use of the short straight. Sebastian Vettel now sets the fastest lap time – Mercedes in the meantime have just come out of the garage. Red Bull should also be looking strong this weekend. 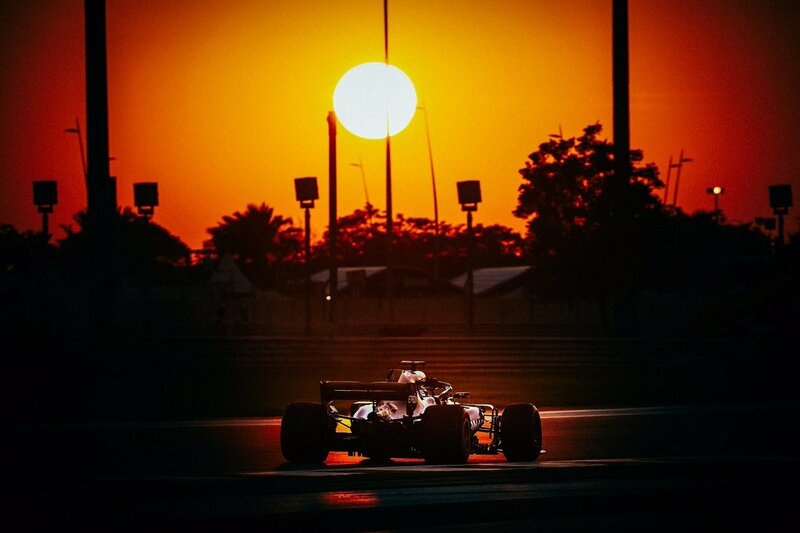 At the moment, it’s Vettel, Raikkonen, Hamilton and Bottas who make up the top 4 – Red Bull racing are now making their way round the track too but temperatures are changing as the sun sets. Ricciardo now goes 4th fastest – not bad, Verstappen goes 5th fastest, right behind his team-mate. Let’s not forget, this is also Daniel Ricciardo’s last race weekend with Red Bull racing, he’s off to Renault next year – there’s lots of changes with drivers and teams for next year. At the moment, Ferrari are using more power on a different mode for their car. Drivers are now back in the garage and getting ready for the final run for Q1 – Lewis Hamilton is now back out on track. His team-mate, Valtteri Bottas is right behind and they’re looking stronger but also saving their tyres. Bottas just goes faster than Lewis Hamilton – Ferrari are still the ones to beat, at the moment. Fernando Alonso has made it through to Q2 – drivers are now getting ready for the second Qualifying session. The track temperature is still dropping and the sun is setting – with lower temperatures, it normally offers drivers much more grip. Lewis Hamilton is the first car out on track. Ferrari are now making their way round the track, Kimi Raikkonen can’t beat Hamilton’s track record, for now. Bottas now comes into the pits – he’s currently in P2. At the moment, we have Hamilton, Bottas, Raikkonen, Vettel, Ricciardo who make up the top 5 drivers. Max Verstappen is out on track, he’s trying to improve but on the ultrasoft tyres, he’s not improving – currently in P10. Max Verstappen isn’t happy, he’s talking to the team through team radio and not happy with his lap times or how the car is performing for the moment. His team-mate, Daniel Ricciardo on the other hand is up in P5. What an improvement by Max Verstappen – he’s up in P2! That was close for Ricciardo – he was nearly out of Qualifying! It’s the final run for Qualifying – Lewis Hamilton is the fastest man on track but all this could change in Q3. Drivers are now making their way back out onto the track, the sun has set, the lights are on and the temperatures have dropped even more – conditions will be like this for the race so it’s an important session. There’s 10 minutes to go as drivers are making their way round the circuit. Hamilton on his lap, makes a mistake but he’s still looking strong for Q3. In the meantime, Grosjean now sets the fastest lap time. Lewis Hamilton now sets his time of 1:35.295 – another track record. Valtteri Bottas goes second fastest, Mercedes are looking on form again. Ferrari are now making their way round the circuit. Raikkonen not looking as strong going 5th fastest. Sebastian Vettel however splits the Mercedes going second fastest with a great lap time – it’s close between Hamilton and Vettel. Drivers are now back in the garage and getting ready for the final run in Q3 – this is going to be close! Lewis Hamilton now makes his way out onto track – Ferrari are still in the garage and waiting. Kimi Raikkonen now makes his way out onto track – all the cars are now out on track. Ferrari and Red Bull are both looking strong however so things could change! No! Mercedes are the fastest team – with both Hamilton and Bottas locking out the front row! What a result – what lap times!